New Zealand’s Labour government refused the USS Buchanan entry because the United States would neither confirm nor deny that the warship had nuclear capability. David Lange’s government, elected in July 1984, had made clear its intention to pursue policies that would establish New Zealand as a nuclear-free country. This was a popular stand, and by the end of the year nearly 40 towns and boroughs had declared themselves nuclear-free. Labour announced its decision to ban ships that were either nuclear-powered or -armed. The US policy to ‘neither confirm nor deny’ the presence of nuclear weapons on any of their warships soon led to a stalemate. The US decided to test the new government’s resolve. 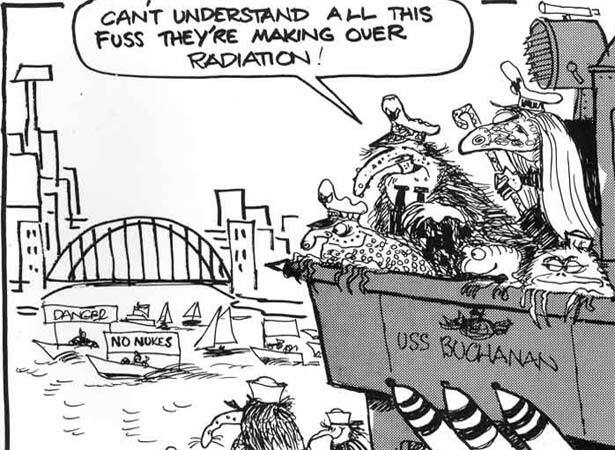 In late 1984 it requested a visit by the guided missile destroyer USS Buchanan, which had been commissioned in 1962 and was unlikely to be nuclear-armed. The Americans assessed that it might slip under the political radar. ‘Near-uncertainty was not now enough for us,’ Lange recalled. ‘Whatever the truth of its armaments, its arrival in New Zealand would be seen as a surrender by the government.’ He had hoped the Americans would offer to send a less ambiguous vessel, but it was the Buchanan or nothing. On 4 February 1985 the government said no. Within days Washington severed its visible intelligence and military ties with New Zealand and downgraded political and diplomatic exchanges. US Secretary of State George Schultz confirmed that the United States would no longer maintain its security guarantee to New Zealand, although the structure of the ANZUS treaty remained in place. We have 4 biographies, 3 articles, related to USS Buchanan refused entry to New Zealand.